Savvy Auntie: Savvy Auntie Goes Beyond The Rack! Savvy Auntie Goes Beyond The Rack! I'm proud to announce the latest sponsor for Savvy Auntie! Beyond The Rack is an exclusive shopping club where members have access to limited-time, flash sales events of designer goods at prices up to 70% off retail. Basically, they announce an incredible deal and you have a limited time to make the purchase - before it's gone forever. The brands that Beyond the Rack has partnered with are some of the brands we covet the most, from Juicy Couture, Diesel and Puma - to Gucci, Christian Dior and Karl Lagerfeld. And many more! 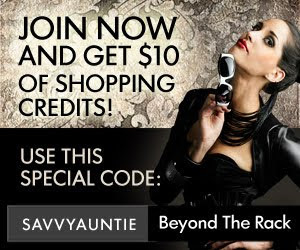 Beyond The Rack's stunning ads are running throughout SavvyAuntie.com, and I'll use Twitter to let my readers know about some extra special offers from Beyond The Rack - and some really luxurious prizes too. When I tweet out an offer from Beyond The Rack, I'll include [sp] so you know it's sponsored. In the meantime, if you decide to become a member, go to this page and use code SAVVYAUNTIE to get a $10 shopping credit. When you log in, you will see ($10 Credit) next to "Account" at the top of the page. Thanks to Beyond The Rack for giving Savvy Aunties some great deals on some fabulous fashion! PS - Some offers will be exclusively promoted via Twitter, so please login or join Twitter and follow me at Twitter.com/SavvyAuntie to take advantage of them! Beyond the Rack is terrible! I waited over a month to receive my purchase, and have waited over 3 weeks for my return credit to be processed. Customer service and accessing account info on their web site is a joke. I think Beyond the Rack is amazing. The customer service team was very helpful at getting me the information I needed. TERRIBLE! They charged my credit card 3 weeks ago and STILL have not shipped my item. They obviously don't have a phone number to call and they only reply back with automated messages. Never shopping here again. Beyond the Rack may have great deals but they are so disorganized. They never ship anything out yet they charge you immediately for your purchase. I have been waiting for almost a month now, I sent them two e-mails and they told me my package was supposed to ship yesterday and it did not. My sister has been waiting for a month for her purchase and they just sent it out after she sent them three e-mails and demanded her money back because of the lateness. Don't waste your time with them bacuse it isn't worth it. Their prices are good, their merchandise is just ok most of the time and they only refund by store credit. This will be my last time shopping with them. They are the worst online shopping site I have ever shopped with. I buy nearly everything online and I have never dealt with such a disorganized company. They charge you immediately, even before they have the items in stock. Ridiculous!